In 2016 an event took place in global health which failed to make major headlines. Over a two week period over 150 countries simultaneously changed their currently used polio vaccines to one deemed more efficient. The move is a demonstration of the concerted efforts of countries across the globe – and a testament to the efficiency and cooperation that has defined those efforts – that have made the vaccination campaign against polio so effective. As recently as 1988 polio was endemic to 125 countries. At the time, there were over 350,000 documented cases of polio-caused paralysis in children across the world. This figure is down to only 37 reported cases in 2016, marking a hugely successful eradication effort. With so few cases, polio has largely receded from the public eye. It has not been an issue in more economically developed nations for many years, as vaccination of children in these countries is commonplace. Only two countries remain which regularly see cases of the wild type poliovirus: Afghanistan and Pakistan. In both countries efforts to deliver the vaccine have often been hindered by political instability and tensions within areas of both countries. This has resulted in them acting as strongholds for the virus. For as long as a single individual remains infected with polio, there lies the potential for the infection of others and a global comeback. The World Health Organization (WHO) have deemed the resurgence of the disease as a very credible risk. They estimate that if polio was allowed to spread once again unchecked, there lies the potential for 200,000 cases occurring per year after a ten year period. It is therefore imperative that the last remaining cases be treated, as well as continued vaccination campaigns across the globe to ensure reinfection risk remains low. Why the switch to a new vaccine? After an evidently effective vaccination campaign, with a vaccine that is clearly effective, a question comes to mind: why was a global switch over to a new vaccine necessary? The effort to change the vaccine over such a range of countries and in a short space of time was a considerable logistical task. Previously, the countries involved in the switch over used a trivalent oral polio vaccine (tOPV). This vaccine is formed of all three strains of the virus in a weakened state, allowing the body to form an immunity to the virus, giving them a degree of protection should they be exposed to wild type poliovirus. Complications occurred as it was found that due to the use of a live strain of the virus, the capacity was still there for the weakened poliovirus in the vaccine to mutate. This can allow for the virus within the vaccine to cause another form of polio disease referred to as vaccine-derived poliovirus (cVDPV). The poliovirus primarily multiplies within the intestine. Due to this viral particles are excreted when an infected individual — or one that has recently received the vaccine — defecates. In communities with poor levels of sanitation where drinking water is contaminated, this can lead to reinfection of other individuals. If immunisation rates within this community are low, this can potentially lead to a vaccine derived mutated strain circulating within the population. It was found that around 90 percent of cVDPV cases were caused by the type 2 poliovirus strain within the vaccine. As of 2015 wild type 2 poliovirus was declared eradicated, with the last known case occurring in India in 1999. Due to this, it was decided to switch to a bivalent vaccine that would not contain the type 2 strain in an effort to reduce the rates of vaccine derived polio cases. Alongside the bivalent strain, a dose of the inactivated polio vaccine (IPV) injection would be administered to offer further protection. The results of the switch over are currently in their early stages. A year on from the change, many studies have claimed hugely positive results. Others indicate that there may be potential for reinfection in the future should immunisation rates fall. The Global Polio Eradication Initiative — the programme which has overseen vaccination efforts since 1988 — has claimed hugely positive results of the switch over. Analysis of sewage and stool samples revealed that before the switch over, 46 countries were found to have traces of the type 2 poliovirus circulating. Though this does not correlate directly with new infections providing immunisation rates are high, it does allow the opportunity for reinfection of a population where immunisation rates are low. Following the switch over, similar analysis of stool samples and sewage revealed that the type two poliovirus was present in 22 countries from May to August 2016. This was reduced to eight countries from September to December 2016, and seven countries (Afghanistan, Cameroon, Chad, Mozambique, Niger, Nigeria and Pakistan) from January to March 2017. These findings suggest that the decision to exclude the type 2 virus from the vaccination was correct. As no new cases of infection with type 2 poliovirus have been documented since 1999, any remaining circulating viral particles in sewage will likely be directly linked to the vaccine. 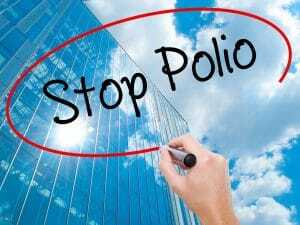 The study shows that by removing weakened eradicated strains from vaccination programmes, in favour of using inactivated vaccines, the vaccine derived cases of polio can also be eradicated. This bodes well for the current plan to stop the usage of all three types of weakened strain vaccines by 2020 and to rely entirely on IPV, which carries no risk of causing any disease. A separate study published in The Lancet found that a vaccination drive of a monovalent type 2 poliovirus vaccine — to simulate the introduction of a wild type or vaccine derived type 2 virus into the population — gave significantly different results between the old trivalent vaccine group and those receiving the newer bivalent vaccine. To summarise the paper’s findings, those that received a bivalent vaccine without the type 2 strain showed less immunity to type 2 strains upon future infection. This also translated to a greater number of poliovirus particles being excreted upon defecation, presenting a future infection risk to other individuals. The study stresses that this did not result in any outbreaks within the community under study, as immunisation rates in the area were high. The data does suggest, however, that there is the potential for other areas with lower immunisation rates to be more at risk of recurrent infections. There also lies the possibility that if polio is not entirely eradicated in the near future, immunity levels amongst the population against vaccine derived strains of type 2 polio will fall. This could lead to potential future outbreaks if strains are removed from the vaccination programme too soon and if IPV had not been introduced. Vigilance is a necessity at this stage of the fight against polio. Yearly numbers of wild type cases amount to less than one hundred, though this does not mean that future outbreaks are impossible. Until there are no more cases at all, the risk is still present. Thorough surveillance systems are necessary to fully ensure that outbreaks do not slip under the radar. In Pakistan, one of the last havens of the virus, checkpoints have been put in place to ensure that every child that passes them have been vaccinated. They note that in a time when mass transit of people is commonplace, a single individual could carry the virus to many different place, making the checkpoints an intrusive, but necessary means of prevention. To date, the polio vaccination campaign has been one of the most successful disease eradication attempts in human history. The coordination efforts involved to allow more than 150 countries to implement a new vaccine within a short period of time lend hope that this level of cooperation may take place in fighting other infectious diseases.